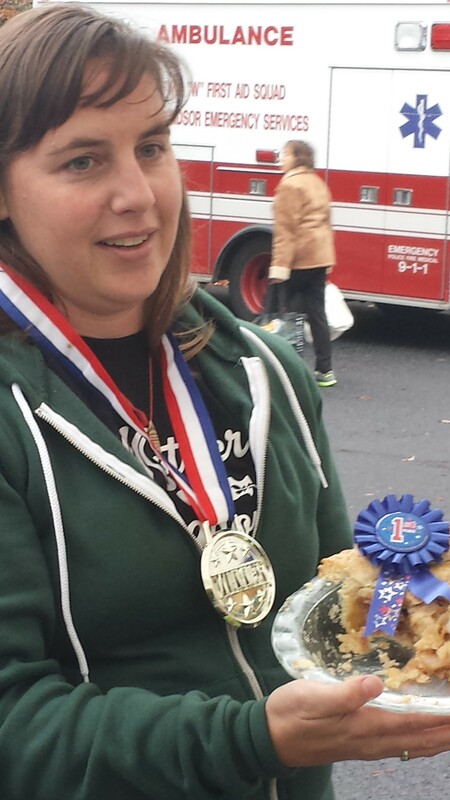 Congratulations to Megan Hodges who was the winner of yesterday’s apple pie contest at the West Windsor Community Farmers Market. The second place winner, Liz Scafa presented a pie with a really good crumb crust, and third place went to Pammie Wagner, who made a pretty lattice crust for her entry. What made Megan Hodges’ pie so special? She thinly sliced her apples (9 of them!) on a mandolin, and “soaked” them in hot apple cider which slightly pre-cooked them, making the filling nice and tender without being mushy. She made salted caramel and layered that decadent addition between the layers of apple. Then she put it all inside a buttery crust and sprinkled the top with Demerara sugar to add crunch. Remember, the award-winning West Windsor market is open on Saturdays right up to November 22, so there’s still plenty of time to shop and to order/stock-up for your holiday needs.